Tuberous Begonias offer truly magnificent value for money, especially when you consider how much of a show they give for their initial cost. And although this lush, tropical looking plant is often sold as a half-hardy annual, tuberous begonias are mostly perennial, and unlike the fibrous rooted cousins, they can be over-wintered for progressively better results year after year. If your begonias have been grown in pots outside then the easiest way to winterize them is to leave them in their pots. Preparation can begin as early as August - in order to give them time to adjust - by bringing them indoors to a cool, and well-ventilated room. Begin withholding more and more water until the foliage dies back - then stop watering altogether. Leave the foliage in place to naturally die back, then within a few weeks, you will be able to remove the dried-up stem and leaves without causing damage to the tuber. The next thing to do is to remove the tuber from the compost, clean it off and remove any damaged or soft parts with a sterilised knife. Dust it – especially any cut areas - with a fungicidal powder. From this point on the tuber can be stored until it is ready to be replanted in the spring. .
Store the tubers as a single layer inside a suitable cardboard box - spaced evenly apart - and keep them in a dry, frost-free and dark place until the spring. 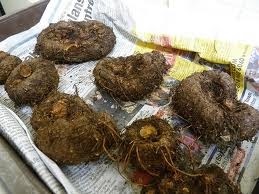 Alternatively, pack the tubers in dry peat, sand, sawdust, or vermiculite to prevent excessive moisture loss. If your begonias are planted directly in the ground then you can start preparing them for winterizing at the end of the autumn season. Begin by cutting back on water, but make sure they are allowed to dry out between each watering. 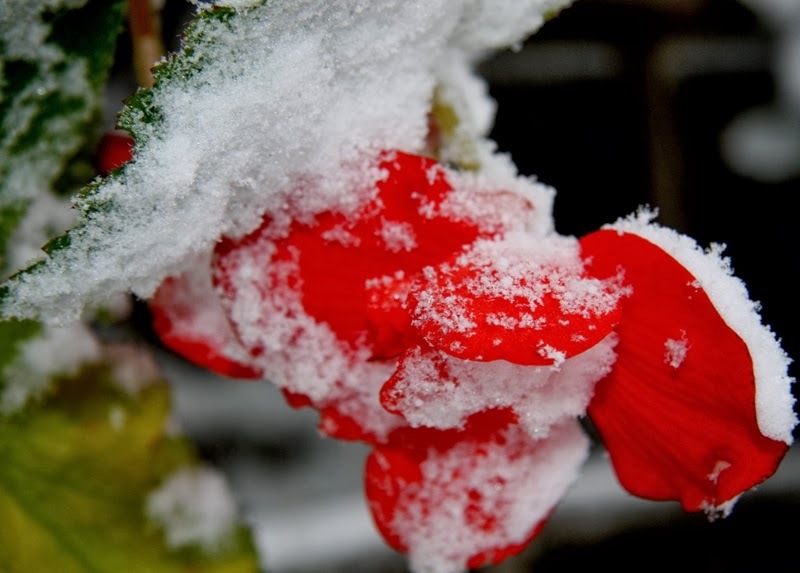 When the tops of tuberous begonias are damaged by the first autumn/winter frost, do not to make the mistake of removing all the old stems and foliage. Instead allow the plant to die back naturally so that the tuberous storage organ can benefit from absorbing the nutrients and carbohydrates that remain in the old growth. Carefully lift the entire plant leaving the root-ball and soil as intact as possible. Place in a dry, cool storage area, and allow the tubers to harden off for a couple of weeks. After this period you can remove any remaining soil as well as any old stems and roots. Cut away any damaged or soft parts with a sterilised knife. Dust it – especially any cut areas - with a fungicidal powder. From this point on the tuber can be stored until it is ready to be replanted in the spring. .Store the tubers as a single layer inside a suitable cardboard box - spaced evenly apart - and keep them in a dry, frost-free and dark place until the spring. Alternatively, pack the tubers in dry peat, sand, sawdust, or vermiculite to prevent excessive moisture loss. Check the begonia tubers occasionally over the winter period to ensure they are still dry and rot-free. Remove any that look suspicious to prevent the risk of further infection. Plant again in spring after the soil has warmed and once the threat of late frosts are over – this will be around the third week of May around the south-east of England.